(BSM) to promote the importance of high building standards, protecting the environment, and saving energy. 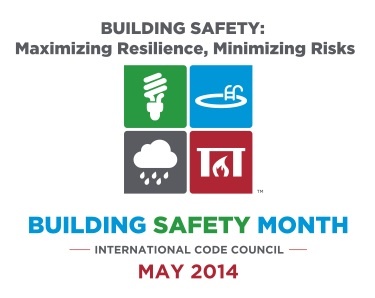 For the fourth consecutive year, President Obama has proclaimed May as National Building Safety Month to underscore that safe building codes and standards have an essential role in decreasing the effects of disasters. As is articulated in Presidential Policy Directive/ PPD-8, National Preparedness, as well as PPD-21, Critical Infrastructure Security and Resilience, building safety, fire prevention, and energy codes and standards help achieve disaster resilience for our Nation. Our Nationâ€™s building safety, fire prevention, and energy codes and standards play a critical role in maintaining and ensuring the safety of our buildings and enable our Nation to better prepare, respond, recover, and mitigate from all hazards. Strong building safety, fire prevention, and energy codes and standards also puts the Nation in a better position to deal with future challenges, such as climate change. FEMA supports ICC’s BSM as it strives to help communities reduce the impacts of natural disasters by promoting the importance of high building standards, protecting the environment, and saving energy. For more information on FEMAâ€™s Building Science Branch, please visit http://www.fema.gov/building-science. For more information on Building Safety Month, visit www.buildingsafetymonth.org. The RCAP Solutions inspections team performs almost 6,000Â housing inspections per year, providing support to an array of families including low income families receiving rental assistance, those in shared housing as well as families participating in the home modification loan program. Our inspectors provide this service to ensure that our clients are provided safe, suitable, quality housing.